Teladoc Inc. TDOC will now provide online back pain treatment via a program called Teladoc Back Care. This solution will provide the company an extensive reach in back pain treatment, the cost of which is estimated at $87 billion, and is the third highest medical-cost driver after diabetes and obesity. Back pain is one of the debilitating conditions affecting millions of Americans annually. This service, which will be provided by Teladoc in partnership with Telespine, will provide members with an online, personalized, and exercise-based treatment plan, along with certified coach consultation. The virtual back pain program should be effective in healing the ailment, as its pilot study showed successful results. On an average, more than 90% of its members realized a 14% reduction in disability and 49% decrease in pain after using the program. Teladoc Back Care is best suited to provide back pain treatment to patients at their homes at lower cost. It is generally found that the traditional modes of treatment, which involve visiting therapists, tend to be discontinued since nearly 15% of the patients do not return for therapy after the first physical therapy visit, with even lower adherence to treatment plans that entail multiple visits a week. Thus, this virtual back pain program should be able to provide complete care to patients. The addition of this service will broaden Teladoc’s existing suite of products and services that include 450 medical subspecialties from non-urgent, episodic needs like flu and upper respiratory infections to chronic, complicated medical conditions like cancer and congestive heart failure. It is fast gaining ground in the rapidly growing telehealth services industry in the United States, with ample scope for flourishing, owing to rising health care costs following inefficient care, duplication of services, significant waste and extreme variation in access, cost and quality of care. The Telehealth leader has the capability to address this inefficiency in care by providing superior quality of care through a platform that caters to consumer demand and physician availability in real-time and in various modalities such as video, web, mobile and telephone. Moreover, the emergence of technology, via big data and analytics, cloud-based solutions, online video and mobile applications, offers the company with huge opportunity for growth. Notably, the stock has rallied 90% in a year’s time compared with the industry’s growth of 21%. Teladoc currently carries a Zacks Rank #4 (Sell). Some better-ranked stocks in the same space are BioTelemetry, Inc. BEAT, HealthEquity, Inc. HQY and OpGen, Inc. OPGN. While BioTelemetry carries a Zacks Rank #1 (Strong Buy), HealthEquity and OpGen both carry a Zacks Rank #2 (Buy).You can see https://www.zacks.com/stocks/buy-list/?ADID=zp_1link&ICI... _1link">the complete list of today’s Zacks #1 Rank stocks here. BioTelemetry beat estimates in each of the four quarters, with average positive surprise of 55.6%. Health Equity surpassed estimates in three of the four reported quarters, with average positive surprise of 11%. OpGen surpassed estimates in the trailing four quarters, with the average positive surprise being 5.7%. 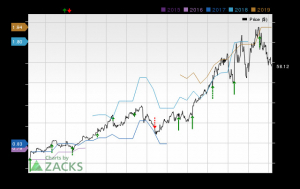 BioTelemetry (BEAT) Earnings Expected to Grow: Should You Buy? Has BioTelemetry (BEAT) Outpaced Other Medical Stocks This Year?